Chrysler Dodge Jeep Ram of Calallen has been selling cars for some time, and we know how important vehicle warranties are for car owners. It gives you peace of mind and allows you to feel like your car will be taken care of when needed. It seems that Chrysler knew this, which may have driven the company to offer its Mopar® Vehicle Protection. This is the first factory-backed extended warranty service that comes with Lifetime coverage and no limits on mileage. At Chrysler Dodge Jeep Ram of Calallen, we’ll show you the all-new Jeep Gladiator, a midsize pickup truck that is built for comfort and off-roading. Whether you take it out on the highway or the trails, it’s sure to impress. The exterior has a similar look to the Wrangler, complete with the ability to take off the doors and change out the roofs. The standard Jeep styling of the rounded headlights and the seven-slot grille will also add familiarity. Some amazing exterior paint colors are waiting for you, too. Sporty and powerful, the Dodge Charger is a full-size sedan that boasts industry-leading features. You can test drive this racing-inspired car at Chrysler Dodge Jeep Ram of Calallen. Let's review some of the interior and exterior options that are available for this American vehicle. More than 10 exterior colors are optional for the 2019 Charger. Plum Crazy, B5 Blue and Octane Red will surely turn some heads on the road. Go Mango and TorRed are some stunning finishes that are inspired by tropical settings. You can also choose Indigo Blue or Destroyer Gray for this full-size sedan. When a vehicle is capable of handling any road condition that is thrown it, drivers are able to drive with supreme confidence. Sadly, not all vehicles can make this claim. One SUV that stands among the chosen and is built to handle various conditions is the 2018 Jeep Renegade. There is a vast array of features packed into the 2018 Renegade that make it extremely capable. These begin with the powertrain. Drivers have two options to choose from. The standard engine is a 1.4L Multiair Turbo engine that generates 160 horsepower. When you choose to drive an SUV, you are choosing to drive a vehicle that offers a variety of uses for its owners. It can move either people or cargo in a comfortable manner. If you are looking for an SUV, then the 2018 Dodge Journey just may have the features that make it the right SUV for you. Chrysler is quickly building a reputation as a leader in automotive technology design. The new 300 exudes this commitment to innovation with a bevy of impressive technology features all designed to improve the driver experience. Take to the streets with confidence with all of these patented features. Chrysler recognizes that smartphones are a way of life. This is why it has included both Apple CarPlay and Android Auto capabilities in the 300. These features allow you to access all of the functions of your smartphone through the Chrysler UConnect touchscreen. At Chrysler Dodge Jeep Ram of Calallen, we can show you all of the advanced features of the Ram 1500 that make its exterior both bold and functional. The new design combines sleek lines with stunning geometrical shapes that will make an impression wherever it goes. To increase fuel efficiency, the front hood and sleek headlamps are designed to improve aerodynamics. The active grille shutters and air dam lead to the lowest frontal drag coefficient in its class. The rear features an aluminum tailgate and integrated spoiler. The Dodge Grand Caravan has long been one of the most popular family minivans. That is why we here at Chrysler Dodge Jeep Ram of Calallen are so excited to tell you all about the various fuel efficiency features of the all new 2018 model. The Grand Caravan utilizes what are known as low resistance tires. This is not to say they aren't safe in any and all weather conditions. Instead, these tires are designed to work with instead of against an engine so that it needs less fuel to move the same distance. It’s not just all fun and games when on an outdoor adventure. What if your Jeep Wrangler JK gets stranded in muddy terrain or a ditch? Or what if you find a vehicle in a similar situation? The great thing about the Jeep Wrangler JK is that you can elect to get one with two types of steel bumpers that solve that problem. Football is the American pastime of the Fall. People go to High School football games every Friday night, college football games every Saturday and professional football teams every Sunday. People who do not have a recreational vehicle to bring all the tailgating necessities with them choose to rough it and go with an SUV instead. SUVs have safety issues other cars do not. Rollover concerns are far less common with other cars than they are with this class of vehicle. 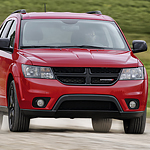 A tailgater who wants a safe SUV should consider purchasing the Dodge Journey.